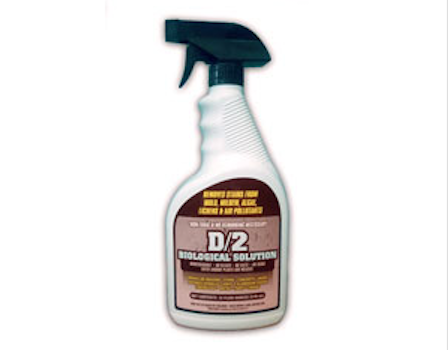 D/2 Biological Solution is a biodegradable, easy to use liquid that removes stains from mold, algae, mildew, lichens and air pollutants. It is effective on marble, granite, limestone, brownstone, travertine, masonry, terra cotta, concrete, stucco, wood, and other architectural surfaces including monuments, sculpture and headstones. A contact time of only 10 to 15 minutes followed by scrubbing with a soft nylon or natural bristle brush will loosen most biological and air pollutant staining. D/2 Biological Solution is effective for removing harmful biological and air pollutant staining from many building materials including masonry, marble, granite, limestone, brownstone, travertine, terra cotta, concrete, stucco, wood, canvas and vinyl & aluminum siding. Delivery is 2-3 working days from dispatch.